Lizzy Vartanian Collier is a London-based writer and curator of mixed Lebanese-Armenian and British descent. Strongly influenced by her background, Lizzy committed herself to the burgeoning art scene in the Middle East. After receiving her masters in Contemporary Middle Eastern art, Lizzy became more infatuated with the movement of contemporary art in and out of different themes and concepts. This has extended to publications both in the UK and the Middle East including Canvas, the Guardian, Harper’s Bazaar Arabia, Ibraaz, Jdeed, ReOrient and Suitcase magazines. She runs the Gallery Girl blog, a platform dedicated to covering the latest exhibitions in London, Paris, New York and the Middle East. Lizzy is also an assistant editor for I.B Tauris Publishers, one of the leading independent publishers of Middle Eastern literature. Most excitingly, and unsurprising given her zeal for Middle Eastern Art, Lizzy is curating the Perpetual Movement exhibition as part of the Arab Women Artists now festival in London. AWAN, which is about to enter its 4th edition, showcases the work of contemporary Arab women artists in the UK, Europe and beyond, providing opportunities for artists and audiences to celebrate, be informed and network whilst exposing new audiences to the work of these often marginalized artists, providing a platform to present the work of Arab Women Artists. The exhibition comprises the work of 7 emerging women artists with roots in the Arab region: Yumna Al-Arashi, Nada Elkalaawy, Shaikha Fahad Al-Ketbi, Thana Faroq, Araz Farra, Nadia Gohar and Najd AlTaher, and considers the relationship between migration and memory in connection to the Arab world and its diaspora. Ahead of the exhibition we sat down with Lizzy to to take a closer look at Middle Eastern art today, her journey with art, and her connection with the concept of Perpetual Movement as a diaspora living in London. Tell me a bit about your journey with art. I have been obsessed with art for as long as I can remember. My parents met at an art gallery so I guess it is fate! I always loved drawing when I was little but I never really had any ambition to be an artist so I studied Art History at university. While I was studying I started a blog (Gallery Girl), where I wrote about the exhibitions I was visiting almost to log what I was doing. Fast forward a few years and I am now being commissioned by other publications to write about art and being invited to curate exhibitions. You’ve studied Middle Eastern contemporary art as a discipline. How has that, combined with your heritage, informed the way that you look at Middle Eastern Art? I did an MA in Contemporary Art and Art Theory of Asia and Africa in the hope of learning more about the visual culture of my mother's birthplace (Lebanon). Unfortunately most of the options on my masters course were on the Far East and Africa, which is great, but not what I wanted to do. I ended up taking a lot of theory heavy subjects and writing about concepts I'd never heard of before. I wrote my MA dissertation from personal study into contemporary art of the Armenian diaspora. (My family is Lebanese-Armenian). My real education came after my studies when I spent much more time meeting artists and visiting exhibitions on contemporary art from the MENA region. When it comes to contemporary culture I really do think you can learn so much more by seeing things and meeting people in person. In very exciting news you’re curating the Perpetual Movement exhibition in March for AWAN, featuring artists such as Yumna Al Arashi and Sheikha Al Ketbi. What made you choose the subject matter of perpetual movement? My idea for the show is framed around migration and memory. I focused on movement because I myself am living in diaspora in London. I tend to place myself in everything I do, this is not a conscious thing, but it's just that I know myself better than I do anyone else. For a festival called Arab Women Artists Now and to be not living in the region, movement was important to me as some act of movement led to my birth in the UK (my mother's journey from Lebanon to Australia to the UK). I wanted to address the fact that these women with roots in the region, for some reason, were being brought together in London. There stories are moving, in some cases the artists are moving. Our ideas about Arab women are also moving, they are covering more ground, and it is very exciting. Memory is also very important to me, especially as they are passed through generations. I had a deep intense love for Lebanon long before I ever went there and the stories my mother used to tell me and my brother about Beirut always made it sound like such a magical place. I have been to Lebanon, but there are some places that it is unlikely I can go to, at least not any time soon, but thanks to stories my grandmother fed my mother, I feel like I know Aleppo too. The seven artists who comprise the show are all women I admire greatly and who approach movement in seven unique ways. Araz Farra's film shows an Armenian man from Aleppo speaking about the beauty of his city. Meanwhile Yumna Al-Arashi's portraits of North African women document the last generation of women with facial tattoos - she literally documents their faces so that their memory can live on and be passed on to others. Meanwhile Thana Faroq and Nadia Gohar both tackle the passport, a document that should allow for movement, but unfortunately, can also hinder it. Thana's Passport Project consists of the portraits of those who are limited by this document, photographed behind a pane of glass, showing movement being blocked. Nadia's passport photos of herself show the stupidity related to identification photographs. This act of being blocked is also shown in Najd AlTaher's Al Yaqeen series, where her women are photographed trapped in various situations. In Shaikha's image of Ghaya, her bride is photographed underwater, reaching out for a pearl, she is striding towards her goal. 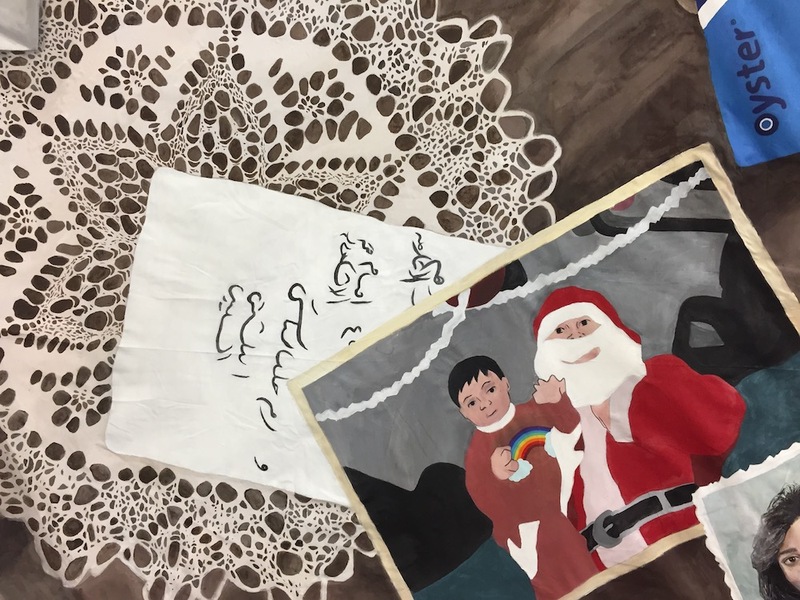 Movement and memory are shown together in Nada Elkalaawy's paintings that blend pieces of her hometown of Alexandria with her life now in London, this is particularly powerful in her painting December Child, where a photograph of Father Christmas and an oyster card sit on top of a table that also contains Arabic script and delicate table lace. When people think about bustling art scenes, busy cities like London and New York can come to mind. Tell us your thoughts about the art scene in the Middle East and why is it important to focus on them now. So much exciting work is coming out of the Middle East, especially the UAE. I am dying to go. My only personal experience is of Beirut, which is amazing. The Sursock Museum is one of the most beautiful buildings I think in the world. What I think is so wonderful about the art scene in the Middle East is the fact that it is young, which means a lot of younger artists are able to get the big exposure that they would struggle to get anywhere else. Why do you think showcasing art by Middle Eastern women is so important today? To counter the stereotypes and misunderstandings that people have about women and the Middle East. To be honest I get shocked the questions people ask me when I say I'm going to Beirut - even in 2018 misconceptions about the region still exist. Why is it important to explore the narrative of memory through an Arab woman’s perspective? I think because Arab women are so strong, and they are big characters. They are incredibly well respected by their families and have the power to influence so many people around them, and in turn teach a lot about their culture and personal experiences. As a curator, you’ve spent a lot of time in artists’ studios. What do you enjoy the most about visiting those private creative spaces? I enjoy seeing them in the space that allows them to make work. It is incredibly intimate and a very humbling experience. Being given the opportunity to enter such private spaces is very rare, not many people get to do so. You also get to understand about how the artist works, what music they listen to and what books they're reading, as well as how clean it is and whether they have any posters or influences on the walls. Besides your wonderful exhibition for AWAN 2018, what exhibition are you most looking forward to seeing this year? My friend Joud Halawani Al-Tamimi is an incredible young curator based in Amman. I'm looking forward to seeing what she does next because she always has such amazing ideas. Harper’s Bazaar Arabia and ReOrient are just a few of the publications you’ve written for. What piece did you enjoy putting together the most and why? That is a really tough question! I think I would have to say an article I wrote about Raghad Mardini and Litehouse Gallery, a gallery that she runs in London. I first met Raghad at an opening at the Mosaic Rooms in London when I was still a student and my blog was a baby. Raghad was based in Lebanon at the time and running Art Residence Aley, a residency programme for Syrian artists living in Lebanon. The project is still running and now Raghad has extended it with Litehouse in London. Writing about Raghad for Harper's was very special for two reasons: I had always wanted to write for Harper's, and also because Raghad is a woman that I really admire and for that to be my first article made it even better!